President Shimon Peres can add another title to his growing list of honors – he is now a Sheik. 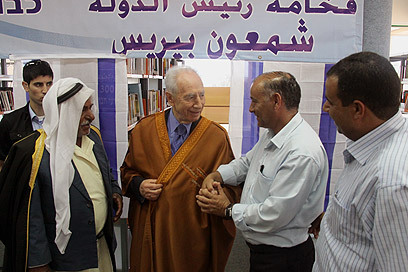 Peres was awarded the title in a ceremony held Tuesday on the Bedouin community of Hura, in the Negev. Hura's sheiks thanked the president for his efforts to achieve Middle East peace, and dressed him – as called for by tradition, with a Sheiks abaya ("cloak"). "The Bedouin community is facing rough times. This is a transitional time for us, from a simple and stable life, to a more modern, if less stable, way of life," Muhammad el-Nabari, the head of Hura Council said. "The coming decade will be critical and important for the Negev. The Bedouins make up one third of the Negev's population and we believe the area will not thrive unless our presence here is addressed." The Bedouins, el-Nabari said, want to become partners in the development of the Negev and want to take part in its financial, cultural and social development." The newly appointed and visibly moved Sheik Peres said: "This visit has been a pleasure. I am deeply impressed by Hura. You have done more for yourselves than anyone else could have." The Bedouins, he said, "Are a part of the Negev. It cannot be developed without developing the Bedouin community, so that it may keep its traditions while joining the modern world." See all talkbacks "Peres becomes Sheikh"